Born in Villena (1979). Titled in classical and jazz trombone by the RCSM of Madrid and CSM Joaquín Rodrigo of Valencia respectively. In the classical field it has been formed with renowned teachers and collaborated with various formations as ORTVE, Gran Teatro del Liceo Orchestra, ORCAM, National Orchestra of Algeria, among others. 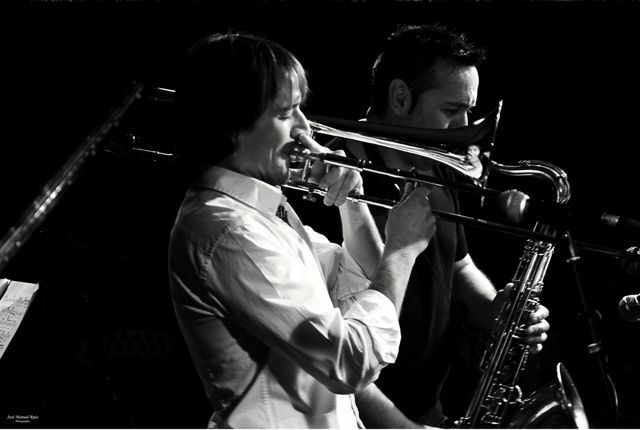 It is introduced in jazz through collective Sedajazz and begins to direct his professional career in this field. He has collaborated with several bands as Sedajazz Big Band, Llibert Fortuny XXL Electric Big Band, Perico Sambeat Flamenco Big Band, Clasijazz Big Band, Big Band Cotijazz, BvR Flamenco Big Band, among others. In these and other formations had the opportunity to share the stage with musicians of the first rank, among which are Toni Belenguer, Carlos Martin, David Pastor, Jesus Santandreu, Perico Sambeat, Mike Mossman, Paul Evans, Jeff Jerolamon, Marc Miralta Javier Colina, Fabio Miano, Ramon Cardo, among others. He has performed at numerous jazz festivals nationally and internationally, highlighting the Jazz Festival of San Sebastián, Madrid, Barcelona, ​​Tolousse, Campeche (Mexico) …. He participates in several recording projects as Latino Blanco Band (Tribute to Gerry Mulligan), Horn Flakes (Sedajazz Big Band), Chema Peñalver New Orleans Jazz Band, and more recently with Tracey Reid and The Sweet Rhythm Kings. In 2012 presents his first project honoring the trombonist J. J. Johnson, called Tribute to Jay Jay. Currently he works as a freelance musician in many projects and taught at various schools and educational projects. © www.itfvalencia2015.com · All Rights Reserved.